November 5, 1860: The day before the election that would decide the presidency–and perhaps the future of the Union–South Carolina Governor William Henry Gist sent Thomas F. Drayton to Washington, D.C. to buy 10,000 rifles from the federal War Department. November 6, 1860: On Election Day, Republican Abraham Lincoln faced three candidates. His Illinois nemesis, Stephen A. Douglas, was the Democratic favorite in the North. Southern Democrats had bolted from the party convention and were running their own ticket, headed by John C. Breckinridge. (Lincoln was not even on the ballot in nine southern states.) 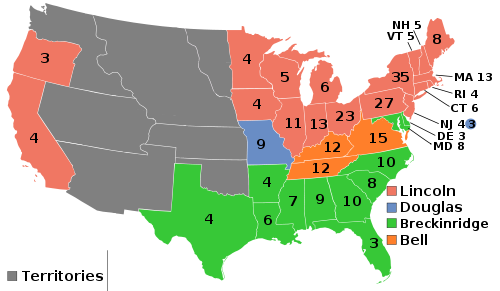 Moderate Democrats, unhappy with those two options, formed the Constitutional Union Party, and ran a ticket with John Bell of Tennessee and Edward Everett of Massachusetts.Lincoln won only forty percent of the popular vote, but it won him 18 states and 180 electoral votes. Douglas’s 1,382,713 votes (compared with Lincoln’s 1,865,593) earned only two states (Missouri and New Jersey) and a mere 12 electoral votes. The breakaway candidates fared better in the Electoral College: Breckenridge and the Southern Democrats won 11 states and 72 electoral votes; Bell’s Constitutional Union Party won Virginia, Kentucky, and Tennessee and 39 electoral votes. 81.2 percent of eligible voters cast ballots, the second-highest rate of participation in United States history, after the hotly contested 1876 election.